Along with the armada of motorcade and helicopter lugging transports, as well Air Force One and other special air mission VIP aircraft, a C-17 outfitted as a mobile emergency operating room accompanied President Barack Obama on his historic visit to Cuba last week. The concept is called a Tactical Critical Care Evacuation Team-Enhanced, or “TCCET-E” for short. 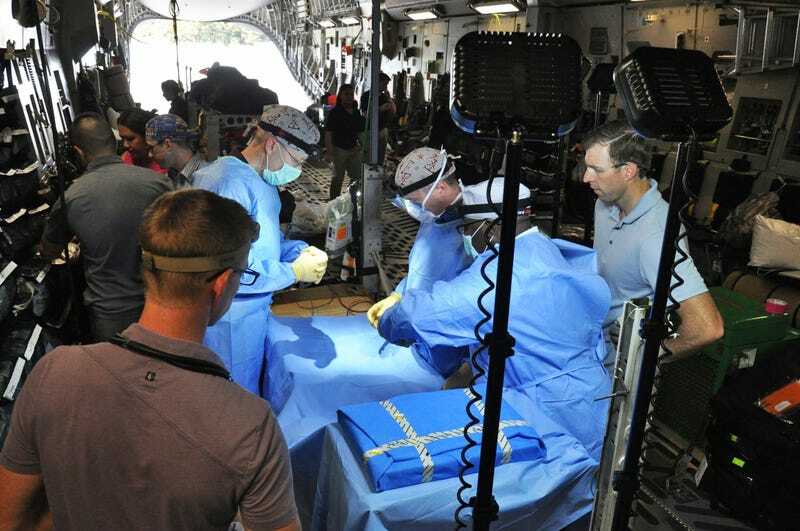 The team can board a C-17 carrying bags of medical gear and have the aircraft’s cargo bay set up and ready to receive patients for major surgeries in mere minutes. This same philosophy has had a huge impact on how and where field hospitals are set up in war zones and where medevac aircraft are based. Now the Air Force is using their airlift capabilities to bring an operating room wherever it needs to be, which in the C-17s case includes austere airstrips, and in this case a country that was formally a dire enemy of the United States. TCCET-Es are made up of five people, including a surgeon, anesthesia provider, emergency physician, emergency nurse and an operating room tech. These teams have already trained how to work as a surgical unit inside the confines of a C-17’s belly. When the team deploys, they carry bags of gear weighing less than 500 pounds total. From the bags being unzipped, they can be ready to operate in just minutes and can even do so while flying. During their mission to Havana, the team was plussed up by the addition of a Critical Care Air Transport Team. This allows the TCCET-E to react to multiple causalities that would need to be airlifted out at the same time. With the extra support, they can handle three critical patients at once and provide intensive care for another six if need be. This “fast and forward” mentality within the Air Force provides incredible flexibility to commanders during times of conflict or national disaster, but exactly why the team was sent to Havana remains unclear. Obviously the president’s trip had its risks, it was the first time the president had been to Cuba in nearly a century, and we don’t know what limits Cuba’s strong-arm government put on the Secret Service. As for president’s own emergency care, a doctor travels with him and Air Force One has a small operating room onboard. Still, that’s just for the president, and Cuba’s health care system and security within it may have triggered the TCCET-E’s mission. Either way, it was likely very good training in an unusual environment for the TCCET-E and C-17 crew. Now we will have wait and see if they show up whenever the president visits third-world countries, adding to the ever more complex presidential travel puzzle.